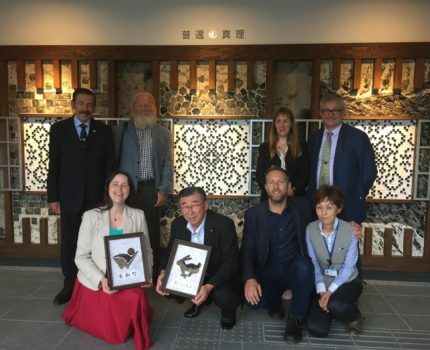 In July 2016 the Sainsbury Institute was involved in the world’s first twinning of archaeological sites, between the Grimes Graves Neolithic flint mines in Thetford, Norfolk, and the Hoshikuso prehistoric obsidian mines in Nagawa-machi, Nagano, Japan. And in October we helped with an exhibition of prehistoric Jomon Flame pots from Niigata prefecture at the Embassy of Japan in London, prior to their being displayed at the British Museum. This talk will look back over the events of the summer and autumn, what led up to this, and the broader context for Anglo-Japanese exchanges in archaeology. We will also look forward to a new research project, starting in early 2017, exploring the globalisation of East Anglian archaeology through a Japanese lens. Simon Kaner MA Cantab, PhD (2004) is Director of the Centre for Japanese Studies at the University of East Anglia and Head of the Centre for Archaeology and Heritage at the Sainsbury Institute. He is an archaeologist specialising in the prehistory of Japan. A Fellow of the Society of Antiquaries of London since 2005, he has taught and published on many aspects of East Asian and European archaeology. He has undertaken archaeological research in Japan, the UK and elsewhere and worked for several years in archaeological heritage management in the UK. His recent publications include The Power of Dogu: ceramic figures from ancient Japan (2009), which accompanied a major exhibition at the British Museum. Other works include Jomon Reflections: Forager Life and Culture in the Prehistoric Japanese Archipelago by Kobayashi Tatsuo (2005), which he adapted and edited with Nakamura Oki. He is also currently completing an edited volume The Archaeology of Medieval Towns: case studies from Japan and Europe.